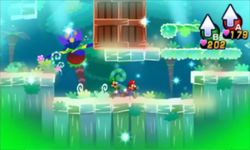 Dreamy Somnom Woods is the Dream World's version of Somnom Woods in Mario & Luigi: Dream Team. It is the seventh location visited in the Dream World. Mario comes here to find the Zeekeeper and wake him from his sleep. After he climbs the tree where the Zeekeeper sleeps, he whacks a rainbow-colored egg that reveals the guardian himself. However, the Zeekeeper reacts aggressively and chooses to fight Giant Luigi. After being defeated, he learns of Bowser's and Antasma's invasion and offers to help the Bros. get to Dreamy Neo Bowser Castle. The Zeekeeper then teleports himself and Mario back to the real world. The special attack Luiginary Typhoon is learned here. This page was last edited on November 20, 2017, at 19:33.